How to Diagnose Hyperparathyroidism: Easy Step by Step Diagnosis. Hyperparathyroidism Diagnosis: Diagnosing Parathyroid Disease. Hyperparathyroidism is the main disease of the parathyroid glands. Diagnosing hyperparathyroidism is discussed in detail. High calcium levels are never normal and almost always indicate a parathyroid tumor is present. How to diagnose parathyroid gland problems, what tests are needed to diagnose hyperparathyroidism made easy. How do we diagnose hyperparathyroidism (parathyroid disease) when most people have never heard of a parathyroid gland until their doctor tells them that they have a problem with one of their parathyroids? The typical response is "Doc, what is a parathyroid gland? I've never heard of a parathyroid or parathyroid gland. How can we diagnose this to be sure that I really have parathyroid disease and how can we be sure this bad parathyroid gland is causing me a problem? "Hey doc, are you talking about the thyroid? Or the parathyroid? What is a parathyroid? What does it mean to have a high calcium level in my blood? How can I have a tumor in my parathyroid gland when I've never heard of a parathyroid gland!?" If you can read and understand this one page, you will know more about parathyroid disease than 90% of doctors. We also have produced an app that you can put your lab tests into and the app and the app will tell you if you have a parathyroid tumor and what your risks are. Download our CalciumPro app or go to the app store and search CalciumPro. Well... Everybody has 4 parathyroid glands, and sometimes one or more of them goes bad. We discuss the symptoms of parathyroid disease on a different page (click here for symptoms). On this page we discuss how to make the diagnosis of parathyroid disease and how to know for sure if you have a parathyroid problem that needs to be addressed. Since parathyroid glands are glands within the endocrine system, we can detect parathyroid disease by measuring the hormone that the parathyroid glands make and compare this level to the amount of calcium in the blood. All endocrine glands make hormones, and all hormones have a "normal" level in our blood. If an endocrine gland develops into a tumor, it will over-produce its hormone. The hormone has effects on other parts of the body (that's what hormones do!). In the case of a parathyroid gland tumor, it overproduces PTH which in turns takes calcium out of the bones and puts it into the blood. It is the high calcium in the blood that makes us sick! Parathyroid glands make parathyroid hormone. Parathyroid hormone controls calcium in the blood. There is a normal range for parathyroid hormone in the blood. If the blood calcium level is too HIGH, it should be associated with a LOW parathyroid hormone level--if the parathyroids are normal... (a normal parathyroid will shut down and go to sleep if the calcium level is high). A blood calcium level that is too HIGH, and is associated with a HIGH parathyroid hormone level then one or more parathyroid gland tumors are almost surely present. That is, the high blood calcium is a result of the excess parathyroid hormone (PTH). It is a parathyroid gland tumor that is the problem. A person with a high blood calcium that has a high parathyroid hormone level at the same time--almost surely has a bad parathyroid gland. Informed doctors should be able to make the diagnosis of hyperparathyroidism if the calcium is high and the PTH level is high at the same time. However... many people (about 20% of all patients with hyperparathyroidism) will have parathyroid disease (caused by a parathyroid tumor) when they have high calcium and NORMAL PTH levels... The point here is that the parathyroid gland is still the problem. This is a more complex situation, so we will discuss it at the end of this page. Let's keep it simple now... high calcium + high PTH = parathyroid tumor. If you really want to make it simple, if the blood calcium is high, then there is over 99% chance that a parathyroid gland has grown into a tumor. It is extremely rare for people to have high calcium levels in their blood... and not have a parathyroid tumor. If you have high calcium in your blood, chances are extremely high you have hyperparathyroidism, unless your PTH is VERY low. Under normal conditions, a normal calcium level will be associated with a normal parathyroid hormone level. Also under normal conditions, a low serum calcium level will be associated with a high parathyroid hormone level; and a high calcium level will be associated a with low parathyroid hormone level. These are all appropriate ways in which a parathyroid gland will react to calcium which is circulating in the blood as the parathyroid glands attempt to regulate calcium in the narrow "normal" range. More detail about the normal function of parathyroid glands is covered on our "function" page. However, it is quite rare for people to have high calcium levels in their blood... and not have a parathyroid tumor. It is common for patients with hyperparathyroidism (parathyroid disease) to have calcium levels that are high one time it is checked, and normal the next time it is checked. ALL patients with hyperparathyroidism will have calcium levels that change from day to day, week to week, month to month. Most patients with hyperparathyroidism have calcium levels that fluctuate from high to slightly high, to high-normal. Fluctuating levels of calcium is one of the '10 Parathyroid Rules of Norman'. One mistake that is often made by physicians who don't see much of this disease (it is pretty rare), is that they will measure the calcium repeatedly to see if it is "staying the same" or "slowly trending up" over time. They (and you) can get a false sense of security when you see that your calcium is only slightly elevated and not getting any worse over time. This is one of the basic BAD assumptions you can make with parathyroid gland disease. Remember, once you have this disease, it will not get better on its own. Furthermore, it will always get worse...slowly perhaps, but it will get worse. Read more of this web site to understand this basic principle. Something else to keep in mind, the calcium in your blood and in your urine is coming from somewhere--your bones! If you haven't looked at our page of pictures of parathyroid tumors you need to do so.... look at the tumors we have removed from patient's necks and compare their calcium levels to yours. Parathyroid disease, calcium, parathyroid calcium disease, parathyroid gland problem. Parathyroid problem and parathyroid disease. Hyperparathyroidism (over-activity of the parathyroid gland) occurs because one (or more) of the parathyroid glands will be making an inappropriately large amount of parathyroid hormone in the face of an elevated serum calcium. This can be detected with appropriate blood tests. Another way to confirm this diagnosis is by measuring the amount of calcium in the urine over a 24-hour period of time. (note: this is not done very often any more, and typically is done only if the patient's calcium and/or parathyroid hormone levels are only a little out of the normal range and the doctor wants to really be sure of the diagnosis). If the kidneys are functioning normally they will filter much of this calcium in an attempt to rid the body of calcium leading to an abnormally large amount of calcium in the urine. Measuring calcium in the urine, however, is an indirect measure of parathyroid activity and is only accurate in about 25 to 40 percent of the time (in other words, MANY patients with hyperparathyroidism will have NORMAL amounts of calcium in their urine--so having a normal urine calcium test does NOT mean you don't have hyperparathyroidism). Typically, the best way to diagnose primary hyperparathyroidism (disease of the parathyroid glands) is by showing an elevated parathyroid hormone level at the same time you have elevated serum calcium. 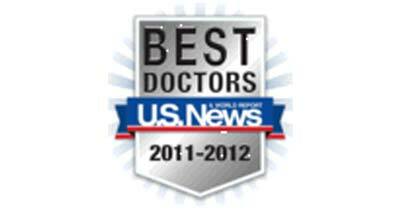 Most doctors are not very good at diagnosing parathyroid problems and hyperparathyroidism. Normally, parathyroid disease is found because your doctor checked your blood for abnormalities and found the calcium level was too high. Typically, the doctor will repeat the calcium to see if it really is high, or if it was just a 'lab error'. If the calcium is high again, the doctor will order a parathyroid hormone level to be checked. If the parathyroid hormone comes back elevated...that's it... you almost certainly have parathyroid disease (hyperparathyroidism). If the PTH level is "normal"... that's it, you still almost certainly have hyperparathyroidism. High calcium and and PTH level that is not very low means it is extremely likely you have hyperparathyroidism. Many of you will need to print this page and take it to your doctor so you can show him or her this sentence. And then, print one of our pictures of parathyroid tumors and show it to your doctor too... and show that these tumors come from patients with high calcium levels and "normal" PTH levels. Geeezzz, it breaks our hearts every day to see the number of people who are feeling poorly because of parathyroid disease who aren't being treated correctly because their doctor doesn't know much about parathyroid disease... and won't go through the trouble of looking it up on the Internet, or making a phone call to another doctor who does know. Many patients with large parathyroid tumors have high calcium levels and NORMAL PTH levels... This is still hyperparathyroidism and this still needs to be fixed. Surgery is indicated if the calcium is high, regardless of the PTH level. The chart below shows examples of patient's calcium levels, PTH levels, and whether or not they have hyperparathyroidism and whether or not they need surgery to remove a parathyroid tumor. These are just some examples, and there are a few more different variations... but these are the most common presentations of parathyroid disease, representing at least 99% of all patients with hyperparathyroidism. Patients 1 through 6 are very routine patients with hyperparathyroidism. The diagnosis of hyperparathyroidism should be made by most/all doctors. It's simple, these people have a parathyroid tumor that is making too much parathyroid hormone which makes the calcium go too high in the blood. These patients do not need any more testing. They don't need to measure calcium in the urine, and they don't need any x-rays or scans. They need to find an expert surgeon and have their parathyroid tumor removed. Patients 7 and 8 also have hyperparathyroidism and they also have a parathyroid tumor making too much hormone. These patients are more difficult for the average doctor to diagnose, because the doctor will say "it can't be hyperparathyroidism because your PTH level is normal". This is a very serious mistake. If the parathyroid glands were NORMAL (no tumor present) then the high calcium would make the normal parathyroid glands go to sleep and the PTH levels would be between very low (say, between 5 and 8). At least 20% of ALL patients with hyperparathyroidism are not diagnosed appropriately because their doctor does not understand this. Patient number is easy to diagnosis if the patient is over 35 years of age (adults do not have persistent calcium levels above 10.1). If the person is between 25 and 35 it could possibly be hyperparathyroidism and more testing is necessary... this should not be ignored, and is 90% chance due to a parathyroid tumor, but the difficulty comes from the fact that the labs will bounce around a lot-- up and down. Remember, adults just don't live with calcium levels which are constantly in the 10's... this is almost never normal. Patient 10 is the hardest patient to diagnose. In cases where the calcium is high normal or intermittently slightly elevated and the PTH is high, we rely on lots of other information (for example, do they have significant osteoporosis?, do they have kidney stones?, do they have symptoms of hyperparathyroidism?, do they have excess calcium in their urine (These are the only people that really need a urine calcium test), etc, etc. Patient number 10 needs a more extensive workup, and a more lab studies than patients number 1-8 prior to heading off to the operating room. Patient 11 does not have hyperparathyroidism and should not even have their PTH tested...unless they pass a kidney stone and/or have severe osteoporosis. Patient 11 often contacts us and asks us to consult with them for hyperparathyroidism because they have "almost all of the symptoms". Trust us, if your calcium and PTH are always normal, then you don't need a parathyroid operation. If you are Patient 11, then please realize that you need lots of other testing by an endocrinologist--parathyroid disease is not your problem, and we are not in the position to help. As a final part of this exercise, look at the colorful graph at the bottom of this page and see where calcium levels are in normal humans and those with parathyroid disease. We have a more advanced diagnosis page on a different page of this web site. Most surgeons will not operate on a patient unless they have two or more documented blood tests showing elevated calcium and at least one blood test showing elevated parathyroid hormone (although we do not require this in many patients). Also, most surgeons have only seen patients with scenarios 1 through 6 above, and they will get nervous operating on the 25% of patients who don't present with "classic" labs. Heck, many surgeons won't operate on patients 1-6 unless they have a positive sestamibi scan. 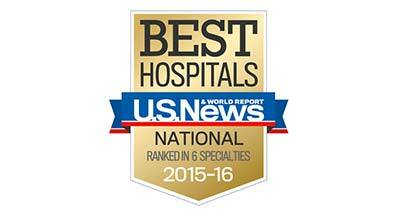 This is fortunate for you, because you probably want a very experienced parathyroid surgeon operating on you anyway! When you get your calcium level checked, they check "Serum Calcium". Serum is the yellow liquid part of blood--that part without the red and white blood cells. Serum Calcium is the standard calcium that is most easily measured. Most of the Serum Calcium floats around in the blood attached to random proteins. The other type of calcium in our blood is called "Ionized Calcium". Ionized calcium is the calcium in your blood that is floating free of proteins, and thus very available to be absorbed into nerve, muscle, and other cells that required calcium to perform their duties. Ionized calcium is not checked routinely. It is more expensive to check, will vary with the pH of your blood, and it almost never requires checking in 'normal' people, unless they have a problem with their Serum Calcium. Even most patients with hyperparathyroidism will not need their Ionized Calcium checked... it's not necessary because the Serum Calcium will be obviously abnormal, and ALL of these people will have abnormally high Ionized Calcium as well. However, in patients who have Serum Calcium levels that are only slightly elevated, or they are elevated and the PTH levels are borderline high, THEN, the measurement of Ionized Calcium becomes important. If you aren't sure you have hyperparathyroidism... ask your doctor what your Ionized Calcium level is... but remember, it is not necessary to measure this on most patients with parathyroid disease. The only two choices available for patients with primary hyperparathyroidism are to do nothing, or to have surgery to remove the parathyroid gland tumor (sometimes more than one tumor is present). Some physicians will elect not to refer their patients for an operation if they have a "mild" form of primary hyperparathyroidism. This is nonsense, it is like being a little big pregnant. It is a mistake to say "mild" elevation in blood calcium means you have "mild" hyperparathyroidism. That is naive and not correct, yet much of this management style stems from the fact that standard parathyroid surgery in the past required the use of full general anesthesia and was a major 3-5 hour operation with big risks to the voice box and other neck structures. Parathyroid operations are not nearly as "involved" as they once were (our average operation is 18 minutes and patients almost always go home within 2 hours of the operation). The new techniques of radioguided parathyroidectomy have changed this "wait and see" attitude, as have many recent studies showing how these little tumors can destroy a patient's body. We now know that primary hyperparathyroidism is a debilitating disease like diabetes that takes a terrible toll on your body over time. It is much more deadly than high cholesterol--and it will make you feel miserable. Bottom Line: the days of doing nothing for hyperparathyroidism are long gone; the days of "watching" your calcium because it is "just a little bit high" are long gone. A little high calcium for many years is very dangerous. It is much better for the patient to have an operation and fix the problem. A little bit high calcium is just as deadly as a very high calcium! Important If your doctor tells you that you have "MILD" hyperparathyroidism and it can wait... then click on our page of pictures of parathyroid tumors. You will see that MILD hyperparathyroidism people have the same big tumor in their neck as people with higher levels of calcium in their blood. You will also see that patients with calcium levels above 12 can often have HUGE tumors... and by then, these patients have severe osteoporosis, many have pacemakers and take 2 or 3 blood pressure medications, and some have even had a stroke. The advice to wait until your calcium goes higher makes no sense, and is advice from the 1970's. We know much more now. Parathyroid disease will always get worse. It will never get better on its own, and it will never stay the same. Parathyroid tumors are not cancerous, but they are more deadly than some cancers because of the destruction they cause on your body. CAN OSTEOPOROSIS MEDICINES BE USED INSTEAD OF OPERATING ? A dangerous trend occurred in the late 2000's. Some physicians began using one the osteoporosis drugs (Fosamax, Actonel, Evista, Boniva, Reclast, etc) to try to increase bone calcium rather than referring a patient for surgery. These are very good drugs but must be used appropriately. They are NOT a substitute for removal of the overactive parathyroid gland. It is important to understand that these drugs work through a different mechanism than does the overproduced parathyroid hormone. There has never been a clinical study that shows Fosamax or Actonel (or any other drug) can be used in patients with parathyroid disease. These drugs do not work on the bone in the same place as parathyroid hormone (PTH), and they cannot overpower the powerful effects of PTH. There is more written about this on other pages of Parathyroid.com. Remember, parathyroid disease is caused by a tumor on one (or rarely more than one) of the parathyroid glands. Giving an osteoporosis medicine will not make the tumor go away. Read more about Fosamax, Actonel and other osteoporosis drugs on our Osteoporosis Page and our Frequently Asked Questions Page. Is it possible to have hyperparathyroidism and not have a high parathyroid hormone level? ABSOLUTELY. This is an advanced paragraph, so hang in there! Remember, 75% of people with hyperparathyroidism will have high calcium levels and high PTH levels at the same time. Some will not be this simple in that their calcium will be high and their PTH is normal, while others have normal calcium and their PTH is very high. This section is about that 25% of people with high calcium levels and normal PTH levels, and much less frequently, those with normal calcium levels and high PTH levels. See the colorful calcium graph below. Although MOST people with hyperparathyroidism have the classic presentation of high calcium in the blood and high parathyroid hormone (PTH) in the blood, about 20% of people with very significant parathyroid disease will have high calcium and normal PTH levels. This is very important... it was discussed in the table above, but we are doing it here again because most of these patients are not being diagnosed correctly... it is overlooked by many endocrinologists (some endocrinologists just don't see many patients with this disease). Every DAY we operate on at least 2 patients with hyperparathyroidism who have high calcium levels but never had a high parathyroid hormone level. Every one of these patients is found to have a bad parathyroid gland (a parathyroid tumor) and they get better after the operation. How can this be? Well, think this through with us... The parathyroid glands control the calcium in the blood. If the calcium in the blood is ever high, "normal" parathyroid glands would sense the high calcium and turn themselves off--and the PTH level would be near zero. Thus, if the PTH level is in the normal range when the calcium is high, then there is something wrong with the parathyroid glands, and one (or more) of them has lost their ability to 'turn off' and it is stuck in the 'on' position. This bad parathyroid gland should be removed. Think of it this way... a "normal" parathyroid hormone level is only normal if your calcium is normal. If your calcium is high, then a "correct" parathyroid hormone would be very low... if your parathyroid glands are normal. If not, then it is the parathyroid glands that are CAUSING the calcium to go high. Have we totally confused you yet? 75% of people with hyperparathyroidism will have high calcium and high PTH levels (like patients 1 through 6 in the table above). Many of these people will have labs that jump around, with the calcium going from high to normal and back to high; and PTH levels going up and down. It is routine for an expert to make the diagnosis of hyperparathyroidism in these people and they will all get an operation sooner or later. Of course, waiting just makes things worse--discussed elsewhere. And, if you have this and your doctor wants to measure the calcium in your urine, then know that most doctors don't do this test any more. There is nothing else in the world that can cause high calcium and high PTH at the same time. A parathyroid tumor is the cause. The only thing that needs to be done is to get an appointment with a surgeon. Scans are not necessary to diagnose hyperparathyroidism. 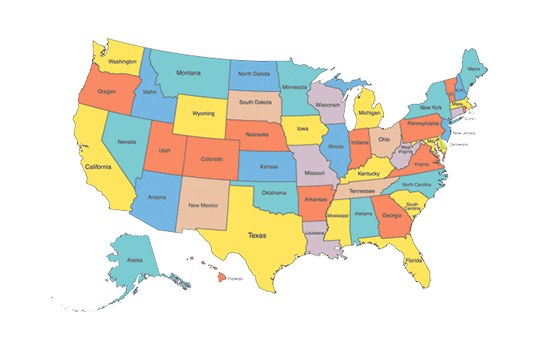 Urine tests are not necessary in the vast majority of cases. Thyroid biopsies are usually not necessary. About 20% of parathyroid patients will have high calcium levels but their PTH levels will be in the normal range (like patients 3, 7 and 8 in the table above). These people can be a little more difficult to diagnose, and quite a few doctors will not make the correct diagnosis (they don't see enough of these to have the experience). These people often will have lots of symptoms. Their calcium is high (typically around 10.5 to 11.6) but their PTH levels are still in the "normal" range. Most of these patients have PTH levels between 40 to 60. If your calcium is frequently or persistently high, and your PTH isn't below 25, then you very likely have hyperparathyroidism. There are many thousands of people in the US who are misdiagnosed every year because their doctors don't know this. These patients will go to the doctor for years getting their calcium and PTH checked every few months while the doctor waits for the stars to align and the patient to have high calcium AND high PTH on the same test. This is silly... but at least 10% of you reading this have gone through this exact situation. Be careful... we get some folks with one high calcium level, a bunch of normal calcium levels, and a bunch of normal PTH levels and they think they have a parathyroid tumor--they do not. The concept here is "trends over time" and repeated levels. Repeated calcium levels above 10.4 and repeated PTH levels above 25 in a person over the age of 40 is almost always a parathyroid tumor. Patients in all three categories are very likely to have hyperparathyroidism and benefit from surgery. The following graph of normal blood calcium levels appears quite complex, but it is not. Do not let it confuse you. If you are reading this web page, chances are you have had at least one high calcium level and aren't sure what this means. You are on this graph in the red area. Remember, patients with hyperparathyroidism have a parathyroid tumor that prevents accurate regulation of calcium levels in the blood... thus the calcium levels bounce around a lot. Most people with a parathyroid tumor have calcium levels that bounce around from high to the high end of normal. People with normal parathyroid glands have calcium levels that are very constant from week to week, month to month, and year to year--their calcium levels do not bounce around between high and normal. Study this graph carefully. Start at the top left of the graph and work your way around the graph clockwise to understand what normal calcium levels are and what it means to have a high calcium level. There are several mistakes we see on a daily basis when doctors are trying to make the diagnosis of hyperparathyroidism in a patient who has a high calcium. The first mistake is that they say "it could be a lab error so we'll check it again". Lab errors are extremely rare these days, but checking it again is correct. The mistake comes when the next calcium level comes back in the "normal range" and the doctor says..."your calcium is normal, there is nothing to worry about". This is a mistake we see in about 80% of all patients with hyperparathyroidism. This is why most patients who undergo surgery to remove the tumor have had the disease for a minimum of 5 years. The doctor was on the right track, but got fooled when the calcium level came back in the normal range. These doctors don't understand that people with hyperparathyroidism have calcium levels that bounce around, and so we expect the calcium level to be up one day and down the next (in fact, almost all people with hyperparathyroidism have good days and days when they feel real bad... this is due to the fluctuations in calcium levels that normal people do not have... when the calcium is high, they are feeling down, tired, depressed, fatigued). People with normal parathyroid glands do not have calcium levels that bounce around. Our brains run on calcium... this is why the human body controls calcium to a much higher degree than any other element in our bodies. We adults feel good when our calcium is constant, not fluctuating, and somewhere in the 9's. The second major mistake regarding calcium levels is that doctors think that having calcium levels in the "low 10's" is normal since it says so on the lab slip (all lab reports come with a "normal range" printed right next to the result). The fact is, it is normal for adults to occasionally have calcium levels in the low 10's (the yellow area on the graph above). However, it is not normal for adults over 30 to have persistent calcium levels above 10.1. Only teens and adults under 25-30 can have calcium levels in the low 10's and still be normal. Not us adults over 40! This is not normal for adults (the lab reports normal ranges for all humans and it is not corrected for age. Adults over 40 should only rarely have a calcium level of 10.0 or higher. Also, we adults do not like having calcium levels in the 10's. Almost all adults feel best with a calcium level somewhere in the 9's. The graph below will show you where calcium levels are in 14,000 patients that we operated on to remove a parathyroid tumor. These are their HIGHEST calcium levels, so each patient here had a number of calcium levels that were lower than this highest number. You can see from this graph that most people with a parathyroid tumor have their highest calcium level about 10.9. This means that their AVERAGE calcium levels were in the mid to upper 10's (they have calcium levels that bounce around in the mid to upper 10's). The third major mistake we see doctors make when looking at blood calcium levels is that they will say "your calcium levels are a little high, but they aren't all too high, so we'll just watch it". These doctors will wait and see if your calcium goes any higher, possibly past some "magic" number like 11.5 (a common "magic" number we hear). Well it turns out that only 32% of the last 20,000 patients we operated on ever had even ONE calcium level that was 11.5 or higher. You can see from this graph, that most patients with a parathyroid tumor have average calcium levels in the mid to upper 10's and their highest number is usually 11 or lower. So if you are waiting for this "magic" number, your tumor will continue to grow, you will continue to feel bad (see our symptoms page), you will continue to get worsening of your osteoporosis, and you will lose the joy of life. And... while you are feeling bad and your bones, heart, and kidneys slowly get destroyed by the high calcium, chances are that you will never get to the "magic" number of 11.5. Most people will never get calcium levels that high (only 23% do), and if they do, they have more damage done to their bodies. The severity of hyperparathyroidism CANNOT be measured by how high the calcium levels are. The size of the tumor cannot be predicted based upon how high the calcium levels are. You either have parathyroid disease or you do not. How high the calcium is doesn't matter... you have a parathyroid problem or you do not. It is a yes/no question. It is not a question of "mild" or "severe". Yes or no. If you do have a parathyroid problem, then get the tumor removed. As we always say, the lady who is 8 months pregnant is not "more" pregnant than the lady who is 6 months pregnant. If you haven't seen our page of pictures of parathyroid tumors, this would be a good time, since they came from people who are in the middle of this graph. A very common mistake we see is that doctors don't realize that NORMAL RANGE for blood calcium changes as we go through different stages of our life. This is propagated by the labs where you get your blood done--they do not give normal ranges according to the patient's age. Instead, they often give the normal range for all humans, which is about 8.8 to 10.7 mg/dl. But as you can see from the green area on this graph, the normal range for blood calcium is dependent upon your age. Although it is true that normal blood calcium can be between 8.8 and 10.7, it is never that range for any one human. When we go through our growth-spurt during our teenage years, we grow lots of bone and our bones become more and more dense. During these years, we have lots more calcium in our blood because we are "turning over" and "remodeling" our bone structure. By the time we get to be 30 years old, the calcium levels decrease normally, and by the time we are 40 we are not allowed to have calcium levels above 10.1 (see the green areas). A VERY COMMON problem we see is that the labs will report the upper limit of normal for blood calcium as 10.7 mg/dl (or 10.4, or 10.5), and the doctor says "your blood calcium is 10.5, that is normal". IT IS NOT NORMAL if you are 35 years old or higher. Adults over 35 are not allowed to have calcium levels "in the 10's". It is that simple! Adults are supposed to have "calcium levels in the 9's". Most people with parathyroid tumors have calcium levels in the 10's! Print this picture and teach your doctors! Mean calcium: 10.894; Median: 10.9; Mode: 10.7; Standard Deviation: 0.597. Percent with average calcium at or below 11.4: 85.57%; Percent with average calcium at or above 11.5: 14.43%. Percent who never had a single calcium level of 11.5 or higher: 79%. Percent that had even one calcium level of 11.5 or higher: 21%. 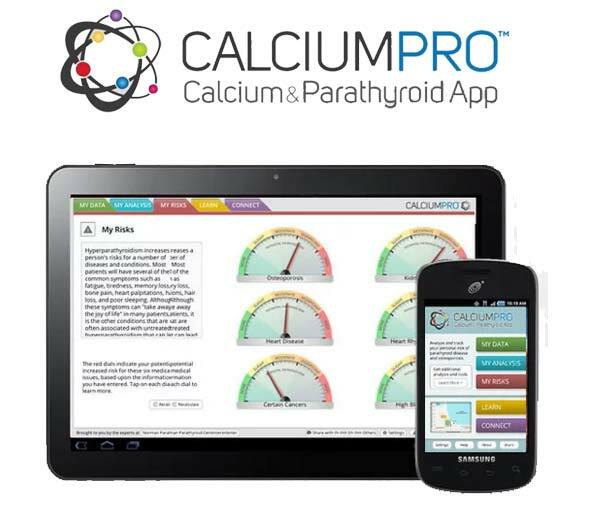 Understand that 79% of patients sent to us for parathyroid surgery never had a calcium level that went over 11.4. It just doesn't happen very often. So if your endocrinologist is waiting until your calcium goes above 11.5 before sending you for surgery, knot that this is simply not founded in medical facts and is not in your best interest. The calcium doesn't just keep climbing as the tumor gets bigger--it may kill you before it does that. Waiting for surgery until your calcium levels go above 11.5 is dumb, is not based on medical facts, and is not standard of care in the US or any other country. 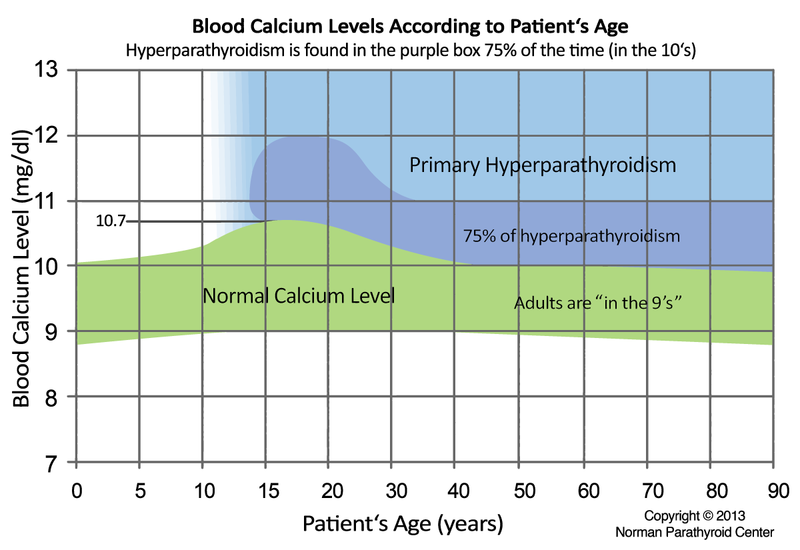 One final note... this graph shows blood CALCIUM levels in patients with primary hyperparathyroidism. This graph is different from the graph on our Hyperparathyroidism page which shows parathyroid hormone (PTH) levels in patients with primary hyperparathyroidism. These graphs have the same shape and thus you could confuse them... but one looks at the calcium levels in the blood, and the other looks at the PTH levels in the blood. These two graphs are central to the diagnosis of hyperparathyroidism. Finally, we'd like to point out that measuring the amount of calcium in the urine is not mentioned on this page because it is a test that is not used much anymore to diagnose parathyroid disease. If your blood calcium is high, then it really doesn't matter what your urine calcium is--- you probably have parathyroid disease. Urine Calcium levels are almost never used to determine if somebody has hyperparathyroidism or not. Most patients with parathyroid disease will have elevated or "high normal" urine calcium levels. But about 10% of our patients with primary hyperparathyroidism have low urine calcium - the test is just not very helpful. Read this page again. If you understand this page well, then you understand parathyroid disease better than 95% of doctors. Also, if there was one page that you want to print and take to your doctor...this is the page. Print this page and our Advanced Diagnosis Page and take it to your doctor. NOTE: Use the little icons at the top of the page to share this information on Facebook or email this page to a friend or doctor. Pictures of parathyroid tumors. This page is very helpful because it allows you to see the different size tumors we have removed from patient's necks, and allows you to compare their tumor with their calcium and PTH levels... You will find one just like yours on this page. Hyperparathyroidism: An Overview. This page has a very good explanation of how the parathyroid glands regulate the calcium--like the thermostat in your home. Must Read! Watch a great video of Dr Norman performing a 4-gland mini-parathyroid operation in less than 13 minutes. COOL! Narrated by Dr Politz. There is no blood: Squeemish Safe! If you like learning by video, then visit our Teaching Videos Page where you can watch short video clips on most parathyroid topics.